Thousands of pets are lost every year, many of which are never reunited with their owners. Collars can be lost and identification tags can fall off. Microchips are a popular and effective method for permanent identification of pets. 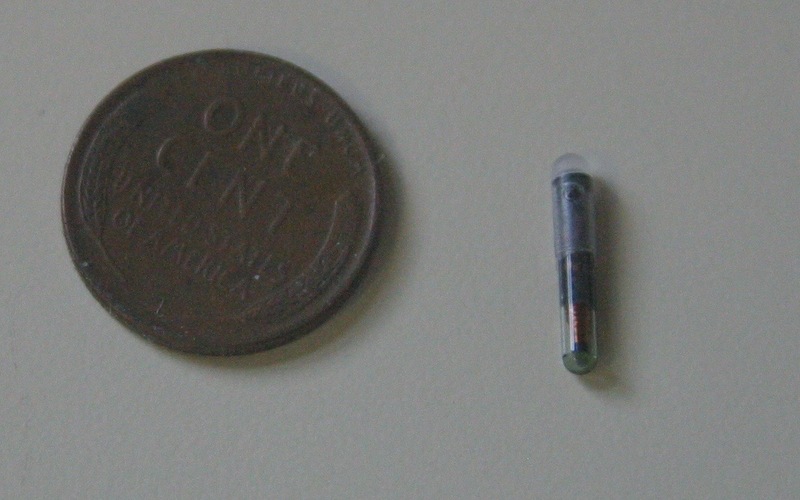 A microchip is a tiny computer chip or transponder about the size of a grain of rice. It stores an identification number and transmits that information through radio waves to the appropriate scanner. The chip is small, compact and easily inserted under the skin. The microchips come pre-loaded in a syringe, and the needle is inserted just under the skin between the shoulder blades where the microchip is implanted. The entire procedure takes less than 10 seconds and is only as painful as a vaccination injection. After injection, the tissue surrounding the microchip reacts to this new substance and forms a casing. This helps prevent migration of the microchip. Since the microchip is made of biocompatible material, rejection is uncommon and infection at the site is very rare. The chip remains safely within the dog, though it may shift a little over time. Size of microchip relative to size of penny. If a pet is lost, runs away, or is found injured and taken to an emergency room, veterinary clinic or shelter, the pet is scanned. If a chip is present when a scanner is passed over it, the chip gives the pets identification number, which is registered with the microchip company. The microchip company maintains the owner’s contact information. We recommended that all pets are microchipped. Even those pets that do not venture outside may escape one day. It is also important that you register your pet directly with the microchip company! It is recommended that you pay the additional fee and have your name and telephone number listed with the microchip code. A microchip can be placed during your routine appointment or when your pet is undergoing any procedures. We commonly insert during vaccine appointments as well as at time of spay or neuter surgery. For more information or to schedule an appointment for a microchip, please call us at (740) 587-1129.